Excerpt: YourStoryClub.com is a platform that is hard earned by my aspiration which finally got wings in the digital world. Chief Editor speaks about herself and her dream project. YourStoryClub.com is a platform that is hard earned by my aspiration which finally got wings in the digital world. I have been fond of reading many books – fictional, non fictional – and even have created a small library at home. I always dreamt of have my own publishing house and then, in 2011, came up with idea to set up an online short story publishing house. Thanks to my husband for enormous encouragement and support, and to his writing hobby which provided me already a small collection of his work to publish online to start with. Yes, it is not an easy task to manage time for my dream especially because I am a homemaker, married with two school-going-kids, staying in a joint family, and trying to seek happiness by making others happy. But, when you have a dream that does not allow you to sleep, everything is possible! My day starts at 5 am by thanking The Almighty for everything He has provided me. Soon after my prayers I immediately log in to my passion. Now, there are more than two thousands writers associated with yourstoryclub.com and it is very important for a publisher to keep her writers happy by responding to them personally and quickly. After an hour of working on the articles as chief editor I change my role to that of housewife working on the daily chores. After seeing off my husband and kids, I rush to publish stories. Finally I get time at 11 AM for my daily routine before my little son returns home from school. My office in form of laptop is always open in my kitchen and dining area. Multitasking is a must and I am able to juggle creativity, customer care, technical support, cooking, and family simultaneously. But, I know that I have only one life in which I have to play multiple roles, and technology helps to do so. For example, I review and edit stories pending for publishing, at Tablet, while waiting for my daughter outside of her dance school. You need to be just ‘yourself’ to fulfil your dream. What is very important is to ‘have a dream’. My vision is to make yourstoryclub.com as a platform to support budding writers, a career launcher for talented writers. I shall feel accomplished only then, when this platform helps someone like me to achieve their dream. Yourstoryclub.com is a fantastic initiative and it should hopefully reach greater heights. All the very best to stay focused to reach this goal. As a mother of two kids myself I know how hard it is to juggle passion vs home maker job. But I thank you for giving aspiring writers like me a chance to share our passion. 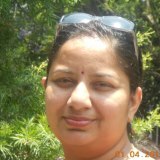 Hello Mrs. Editor, I am new one to your family, YSC. Thank you very much but it is not handled by a single person anymore, we are a small organisation now, AND we are having many amazing writers too. One (wo)man army! Truly inspiring effort mam! Congratzzzzzzzz for this wonderful journey……..I am going through with the same routine……..but still my passion brings back to me Here. Thanks Ankit. Yes, YSC is a family – very well said. My best wishes for your writing profession. On reading this, comments included, I feel like being a part of a family, and not just a website. The warm wishes, by the writers, and the inspirational words, by The Chief Editor, brings a smile on my face. Also, the message given through this great is motivational. Thanks for this platform. Enormous respect! (y) (y) (y) Congratulations ma’am..yes you are an inspiration to all of the members of yourstoryclub.com and others as well…..you are a motivation esp. to kids lyk us who think multitasking is tough……u manage everything so well…..
wow… you’re an amazing person! congratulations! and thank you for helping us writers share our stories with the world! respect!! Thank you. Yes. Our biggest success key is having writers like you and their continuous and unconditional support. Great news for this website, Mrs Tripathi and all the lives connected to the shared dream of creative writing. Cheers to all of us.